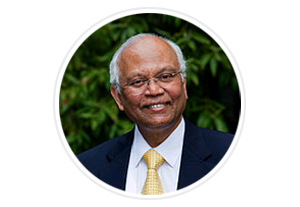 Bhatnagar Fellow & President, Global Research AllianceFellow, Royal Society (FRS), London. Former Director General of the Council of Scientific & Industrial Research (CSIR), India. In 1998, he was elected Fellow of Royal Society, only the third engineering scientist to receive this top honour in 350 years from Royal Society. But in 1998, this scientist also received J.R.D. Tata Corporate Leadership Award, an exclusive honour reserved for Indian Corporates. But then he also pioneered "Gandhian Engineering" -"More from Less for More people" - catering to the needs of the poor. And why? Mashelkar says, as a poor boy, he studied under streetlights. He understands the pains of poverty. Mashelkar fought and revoked the wrong US patents on turmeric and Basmati rice based on India´s traditional knowledge. But to US multinationals, he licensed patents based on the modern knowledge of Indian laboratories, pioneering the trend of reverse transfer of technology from India to Europe and USA. Mashelkar, who is today one of India´s twelve National Research Professors, is equally respected by industry, academia and the Government. He is an independent Director on boards of India´s leading companies, from Tatas to the Reliance group. 29 universities around the world have bestowed upon him honorary doctorates. The Government´s trust in him shows through the twelve high powered Mashelkar Committees, many of them on contentious issues. Mashelkar´s leadership of Council of Scientific & Industrial Research for over 11 years led to transformation of this world´s largest chain of laboratories. This is heralded as one of the top ten achievements of Indian Science & Technology in the 20th century. No wonder he has received honours ranging from Padmabhushan at the hands of President of India to Star of Asia at the hands of George Bush (Sr), former US President. If God were to grant him just one wish, what would he ask? Mashelkar says he will ask for one day on earth again in 2050 to see for himself his dream coming true - India is a leading advanced nation.